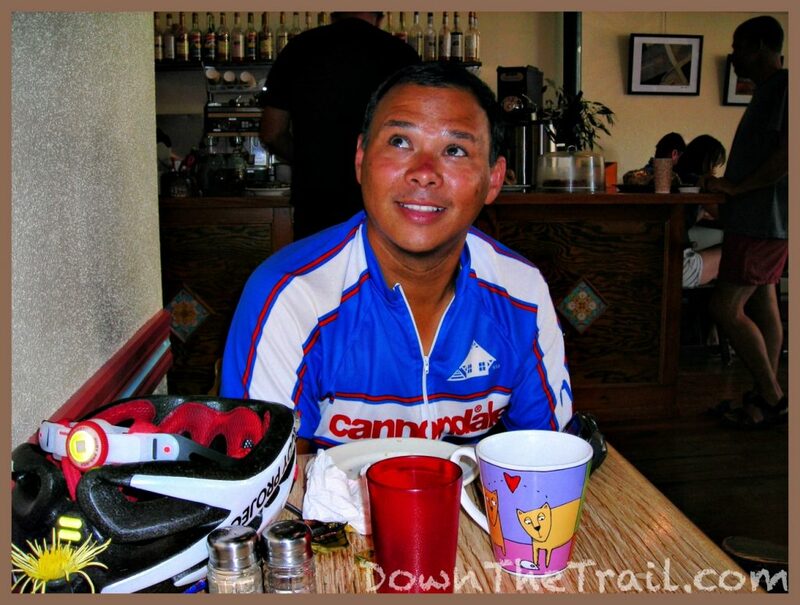 Rudy hit the road immediately after breakfast, heading on eastward to the Atlantic Ocean. I hung around at the cafe to ask about employment. After a brief talk with the owner, Aaron, I was hired! It looks like I’ll be doing dishes from 9am to 3pm on Monday, Tuesday, and Wednesday. They let me use their computer today, and I’m excited to be working here. The staff seemed like a fun, energetic group of people, probably from widespread coffee use! Aaron sings along to the radio in the kitchen, and various friends and family constantly flow in and out. Justin, Maya, and Rose (The westbounders I met yesterday) are all here taking the day off, mainly because of some mechanical problems. The one bookstore/coffeehouse on main street has a table and chairs set up on the sidewalk, and I spent the better part of the afternoon there with Justin. 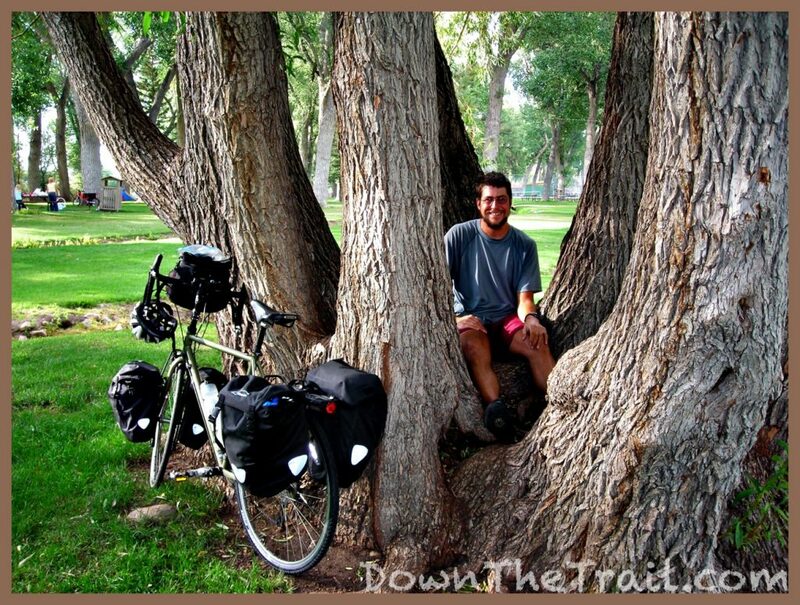 We met two more cyclsts – a couple from Washington that are doing the Great Parks Route. They talked with us for ten or fifteen minutes, and went to get something to eat. Justin and I came up with a little game where one person says the name of a town that we’ve been through, and the other person has to guess the corresponding state. I wasn’t very good at this game… actually I was quite terrible! Justin would name a town I’d been through less than two weeks ago, and I couldn’t remember it without some prompting. It made me really glad that I’ve gone to all the trouble of keeping this journal. Once we got tired of the same scenery and people-watching, we went to McDonalds. Justin had only eaten fast food twice on his entire trip so far. It was his idea to go, really… but I’m starting to feel like a bad influence! First Rudy takes a day off here in Lander, then Justin, Maya, and Rose do the same… and now I’m enlightening Justin on the cheap, hot protein of double cheeseburgers – and the energy surge after a few refills of fountain Coke. He was terrified, and at the same time fascinated, by the nutritional information on the McDonald’s tray sheets. As for me, I can recite some of it by memory! 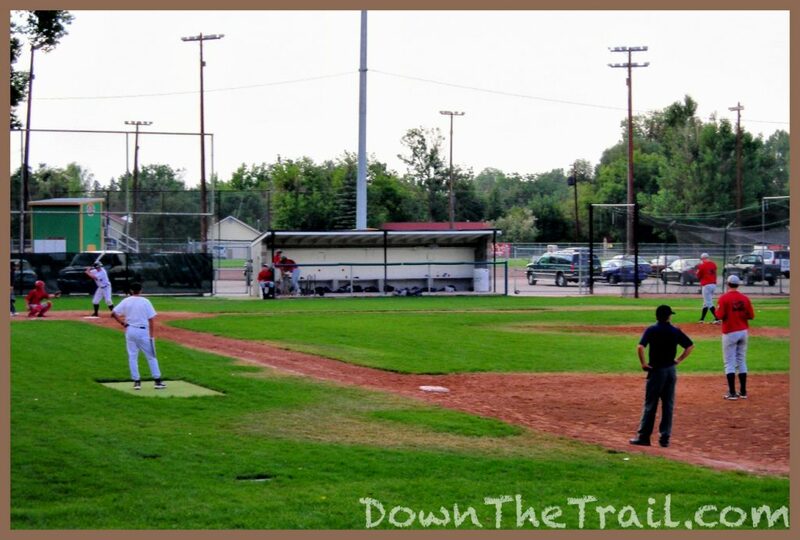 Next we stopped at the supermarket to pick up some food for dinner, and I watched some of a local baseball game at the park – between Lander and some out-of-town team. Evening at the park tonight was very enjoyable, with all five of us traveling cyclists around the same picnic table, cooking our various individual concoctions. Myself from PA, the couple from Seattle, Maya and Rose from New England, and Justin from Jersey, all bringing something different to the table. Maya and Rose are raising money for Greenpeace. In a week or two, the Seattle couple will be backpacking in Peru. Life is good. at the town park – that’s actually a single tree.